We provide two different type rooms. 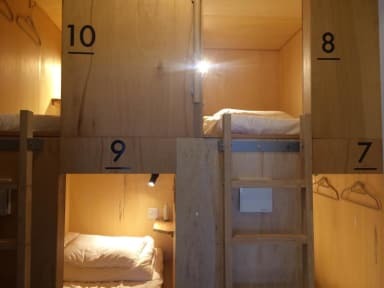 The dormitory rooms with reading light, power outlet, dress hangers, and towel rails provide privacy and comfort with three sets of private sleeping pod box beds forming three of the walls. Separate four bed, and six bed type dormitory rooms are available as a semi private room with a door. The private room is Japanese styled, complete with a traditional tokonoma alcove for a truly authentic Japanese experience. Communal kitchen, shower rooms, and bathroom, and wifi available. You are always welcome to have meals and drinks at the cafe restaurant downstairs during the opening hour. All rooms and facilities are non-smoking. Please enjoy 'living in shotengai' as a new style of traveling. *For cancellations made on the check-in date or one day prior to the check-in date, one night's room rate will be charged. *For No Show 100% of booked stay will be charged. - A late check in may inconvenience other guests. Please abide by the check in times. If you need to check in after 10pm, please let us know in advance. Check out time is 11am. - Although there is no curfew, doors are locked at midnight. We do ask that you refrain from entering or leaving late at night so as not to disturb or inconvenience other guests. 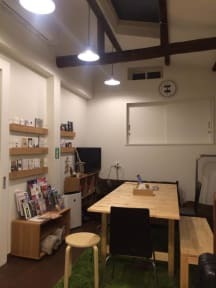 - The Nishiasahi is located within the Endoji Arcade. As voices echo within the arcade, we ask guests to refrain from using loud voices at night to avoid bothering residents.